"La Jolla Cottages, Inc." offers vacation rental family homes in the La Jolla, California and the Coastal communities, just 15 minutes from downtown San Diego and the San Diego International Airport, in the most desirable stretch of the Southern California coastline. All of our homes are close to family friendly beaches, either La Jolla Shores Beach/Kellog Park, Windansea Beach in La Jolla, or Tourmaline Beach south of Bird Rock in north Pacific Beach. Most of our homes are Pet friendly,with private yards, jacuzzis ,pools,with locations close to town, these homes are a great alternative to expensive La Jolla hotels. 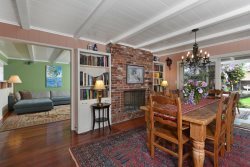 Unlike hotels, which only offer a room or suite with usually less than 350 s'f', La Jolla Cottages, Inc. offers complete family homes, with an average of 2000 s'f'. Fully equipped kitchens with everything you'll need to prepare Holiday meals, Laundry facilities and garages or designated off street parking are provided in our homes as well, spacious dining rooms and outdoor dining areas are also available so your family can enjoy family meals at home while on vacation in San Diego's year round near perfect weather!. Some homes can comfortably accommodate more than one family, and some of the cottages are located right next door to each other so that two or three homes could be rented together, which is perfect for large family gatherings or weddings. Some homes are cozy and affordable at 1000 square feet and others are luxurious up to 6500 square feet in size. We offer estate homes feature private heated swimming pools on half acre lots, and ocean front homes as well as homes with stunning ocean views. La Jolla Cottages, Inc. offers homes and estates within walking distance to restaurants, shopping, art galleries, coffee shops, and more. Some homes are located just a block away from free public tennis courts and a heated 50 meter outdoor swimming pool, (Coggan Aquatic Center) Day Spas (SK Sanctuary), Ocean Front Walk, Bike trails. and beaches. All homes are close to major San Diego attractions: San Diego Zoo, Wild Animal Park, Birch Aquarium, Sea World, Balboa Park, La Jolla Village, Del Mar,Coronado Island and the Gaslamp District and La Jolla for fine dining. 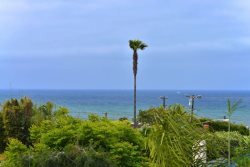 Some homes are close to La Jolla Shores beach, the La Jolla Beach and Tennis Club, Piatti, Barbarella, the Marine Room, George's, Roppongi and other fine restaurants. Our homes are child friendly, comfortably furnished with all the expected amenities,HDTVs with premium cable, HBO/SHOWTIME, wireless high speed internet access, books, DVD, CD and DVD Libraries,beach toys and other games and toys for children, etc. We also provide pac-n-play baby cribs, high chairs, strollers, and other specialty items so you can travel light, even with small children. Most homes are pet friendly, and include fully fenced-in private yards, so unlike most hotels, you can bring your pets on your next vacation! We can even recommend local pet sitters for your pet's needs while you are out. Some homes have private Jacuzzis, private heated swimming pools, hot water outdoor showers, and large patios or decks for entertaining. All homes have bar-be-que grills and everything needed to entertain family and friends after a day at the beach. 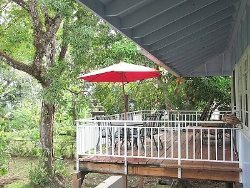 La Jolla Cottages, Inc. are available year-round for weekly rentals (Saturday to Saturday in the July and August, but flexible in the off-season). Please call for shorter stays or longer term discounted stays. Please ask about long term stays for temporary housing, perfect for comfortable beach living during home remodels or for corporate temporary stays or relocation to San Diego. Our homes are professionally managed with routine spa care, landscaping,housekeeping and maintenance, so that you enjoy a worry-free vacation in a comfortably and tastefully furnished home. Property Owners: If you are a La Jolla or coastal San Diego Homeowner seeking professional Vacation Rental Property Management from a seasoned management company, or just trying to decide if owning a vacation rental home is right for you, please contact us for a free, no-obligation consultation. 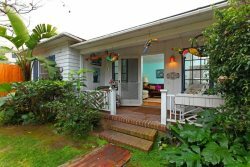 At, "La Jolla Cottages, Inc.", we offer year round vacation rental property management for beach cottages and luxury estates and it is our goal to provide property owners and their Guests with 100% satisfaction. If you are thinking about buying a vacation rental home in La Jolla or other Coastal San Diego neighborhoods, Mireya Schmidt, owner of La Jolla Cottages, Inc., is also an experienced Real Estate Professional with the expertise to help you with your search. Mireya brings decades of experience in Residential Real Estate and financial sales,a 20 year career in Derivatives Risk Management, Foreign Exchange Trading, Banking and Real Estate Sales and as well as an MBA in Finance. Please see our current listings and recently sold homes in the "Homes for Sale" section. With today's record low real estate prices and attractive mortgage rates, now is an excellent time to invest in a second home. Whether your goal is to retire with income, diversify a portfolio or simply buy a vacation home to create life long family memories, owning a second home is easier than ever and more affordable given the income potential of owning a vacation rental home. If you are considering selling a La Jolla or Coastal home, consult with Mireya Schmidt to maximize the marketing of your home to the growing Vacation Rental Market. Real Estate is a substantial investment, experienced counsel is important. Please call for a no cost, no obligation consultation if you are considering purchasing a property.